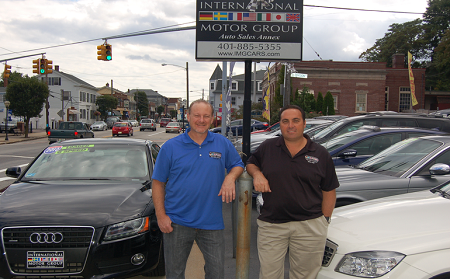 I had no idea East Greenwich had a United Nations until I visited International Motors Group and spoke to Tony Pertrone, Jr. and his brother Lenny. Granted, they may not represent 193 countries like the UN, but there is an impressive list. I arrived a few minutes early for my appointment so I took a little look around. Mercedes-Benz, Land Rover, Audi, Porsche, Volkswagen, Lexus, BMW, Volvo, Alfa Romeo, Ford, Dodge, Pontiac, Nissan, Mitsubishi, Infiniti, Jaguar, Mini, Aura, … well, you get the picture. Very impressive; but wait a minute, what was that over there? A 2013 Hyundia Elantra? I asked Tony and Lenny about the Hyundai. The explanation was simple. It was a great car at a good price. Now, that’s not the company motto, but it is how they do business. Tony does most of the “shopping”. In fact, I asked him about his great tan, thinking he would tell me about his golf game, but I found out that most of the car auctions and other events he attends are held out-doors. (Who knew?) However, unlike typical automobile dealerships, who may purchase a gaggle of cars (what do you call a group of cars? ), Tony is very picky. Not too many cars make their way to their business in East Greenwich; and yes, they are partial to foreign cars (more about this coming up), but, if it’s a great car, it could very well make the final cut. Auctions are not the only source for their inventory. Estate sales, private owners, and even other dealers who may sell Fords and don’t really know what to do with a BWM they take in as trade. So, why foreign cars? Well, that’s an interesting story. Tony Petrone Sr. was born and raised in Italy, and came to the U.S. in 1959. At the time, he was already a Master Technician (automotive mechanic) in Italy, so he quickly found work at a fledging foreign car dealership in Rhode Island. In 1981, Tony Sr., as with many ambitious new-comers, decided to open his own foreign car repair and maintenance business and chose Main Street in East Greenwich to set up shop. In fact, his original is right across the street from the current showroom, and is now the maintenance facility. It wasn’t long that, as the business grew, it was only natural to start selling cars as well as repairing them. Tony Jr. and Lenny grew up around cars – specifically, foreign cars. Tony Jr.’s first car was a BMW (but don’t be too impressed, as Tony tells it, the car was pretty old). Lenny’s first car was a Fiat, but that’s a story for another day. Thirty-three years later, the Petrone family is still at it. As Lenny told me, their reputation is their most important asset. In fact, around 80% of their business is from referrals and repeat customers. I don’t know of any dealership that can boast of that kind of loyalty. Of course, loyalty is earned. Great cars at a fair price is just the beginning. International Motor Group will also finance your purchase. They have relationships with 15 finance companies. They also provide second-to-none service with ASE certified mechanics. Lenny heads the service team as a lead ASE Master Technician with over 35 years of experience. Tony and Lenny are the owners, and they’re always available (unless Tony is out shopping for cars). With their hands-on leadership and experienced sales team (one salesman has been with them 14 years, the other 5), you can be sure that when you come back for yet another car, you’ll be talking to the same folks you made that great deal with the first time. I was wondering about what sort of warranty they offered. Well, not only are all their cars put through a rigorous inspection and reconditioning process, but they also offer extended warranties. In fact, in August, they were giving away a five-year warranty with every car (if I had only known!). Not only that, but free state inspections for the life of your car! Long story short, if you’re looking for a great car at a fair price from a local business (who will be there in the future), International Motor Group is really the only choice.